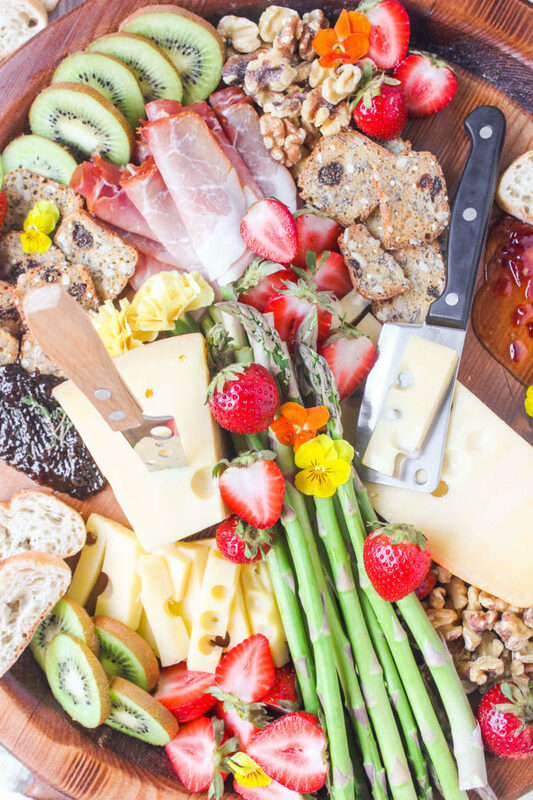 Let’s be honest — there’s never a bad time for a cheeseboard. But what’s delightful about spring is the STUNNING array of seasonal fruits and veggies. 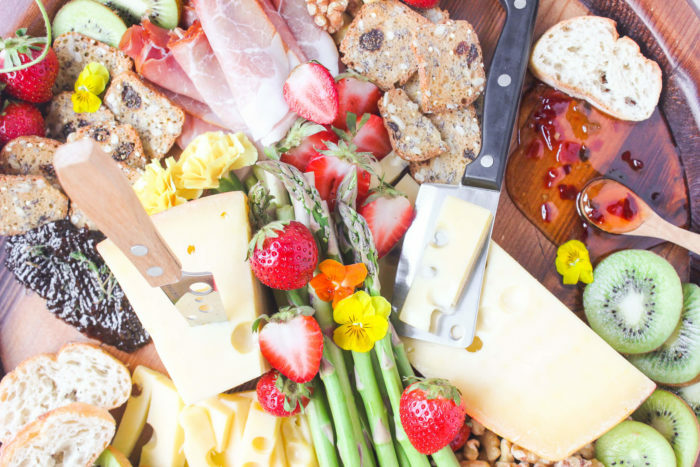 All of which can be compiled to create a lovely, lighter cheeseboard. Yes, I said lighter!! And it all starts with a few wedges of Jarlsberg© cheese. Jarlsberg© has turned cheese making into an art form, so it’s no surprise I rely on it for all my spring cheeseboard needs. Hand crafted in Norway, each wheel of Jarlsberg© is given months to mature, lending the best taste, texture, and holes (seriously!) possible. Made with their well-guarded secret ingredient since 1956 — I asked, they wouldn’t tell me! — Jarlsberg© has a distinct flavor that’s truly irreplaceable. Its soft, buttery color lends a warmth reminiscent of late-afternoon sunshine. Which, oddly enough, is the EXACT time of day you should be serving this board! 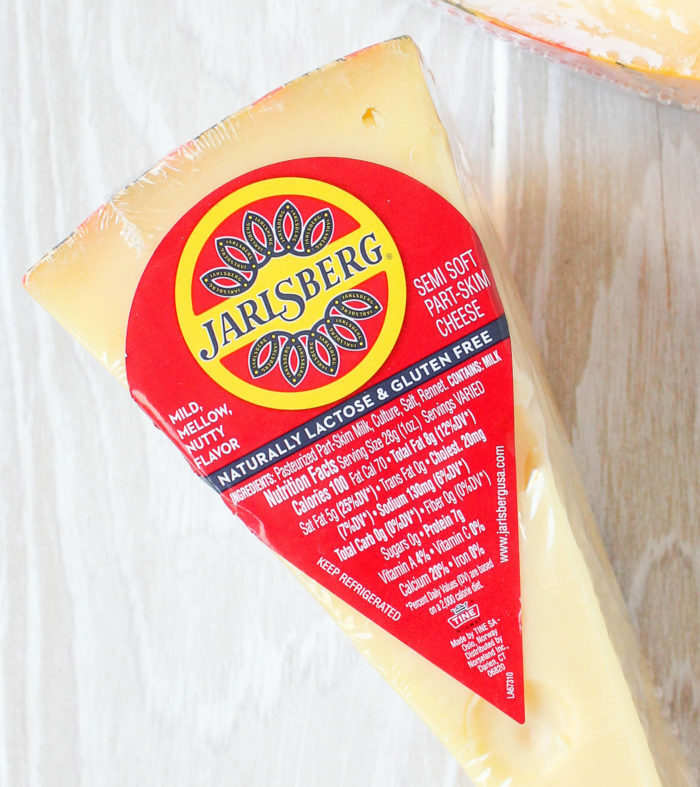 What I love about Jarlsberg© is that it pairs well with nearly any food you can think of. Some cheeses are too sharp, too mild, too firm, or too creamy to be enjoyed a million different ways. But Jarlsberg©? It’s just right. It has the ideal creaminess to be eaten with ALL the spring fruit. Strawberries being a particular favorite. 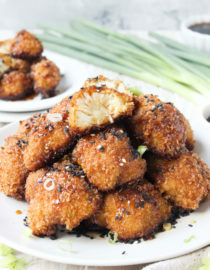 It has the right texture to stand-up to crunchy veggies, without making you chew too hard. Jarlsberg© pairs lovely with an array of jams and spreads, hot pepper jelly and fig jam being my top choices. It looooves carbs. Be it artisanal crackers, sliced baguette, or even mini pretzels, Jarlsberg© digs them all. It tastes great with meat! So if a charcuterie board is more your style, pair Jarlsberg© with prosciutto, salami, Iberian ham, bacon, whatever! 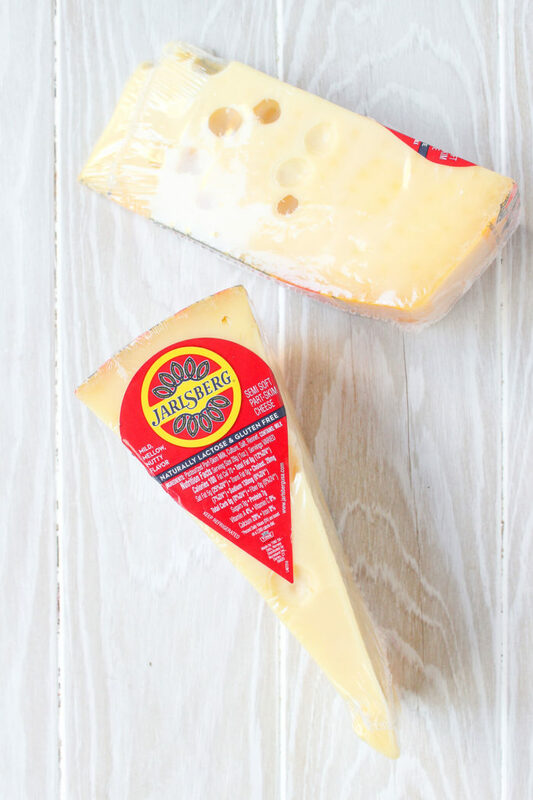 With Jarlsberg©, you truly can’t go wrong. Jarlsberg© is the perfect “medium” cheese, but that in no way means average. 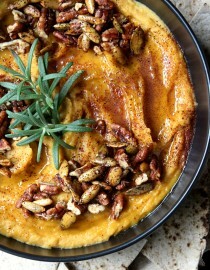 It has a mild, mellow flavor that’s versatile for pairings (see above!) while still being distinctly nutty, sweet, and buttery on it’s own. 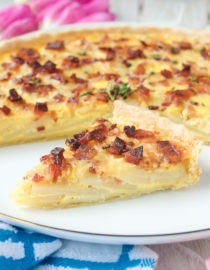 As for texture, Jarlsberg© is the perfect semi-soft cheese, firm enough to be enjoyed plain OR with much crisper fare. Like walnuts, almonds, or hazelnuts! Forgot to mention those before. 1.) Start with an extremely versatile cheese. Jarlsberg© is obviously my go-to. 2.) 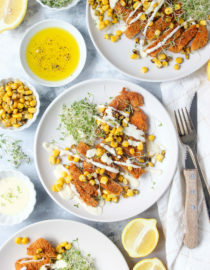 Add crunchy stuff. 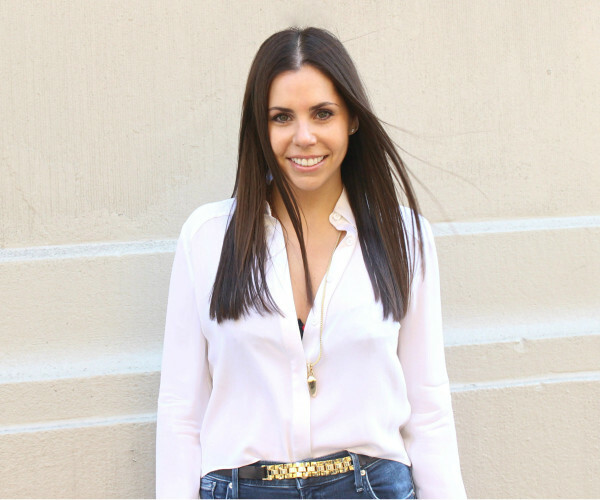 I typically reach for seasonal vegetables, crackers, bread, and nuts! For this spring arrangement I’d recommend asparagus, snap peas, and artichokes for the vegetables. When it comes to crackers I always buy something herbed, while baguettes or ciabatta are my preferred choices of my bread. And literally any nut of your choice will work, so do what feels best! 3.) Bring the FRESHNESS… which to me, means fruit. 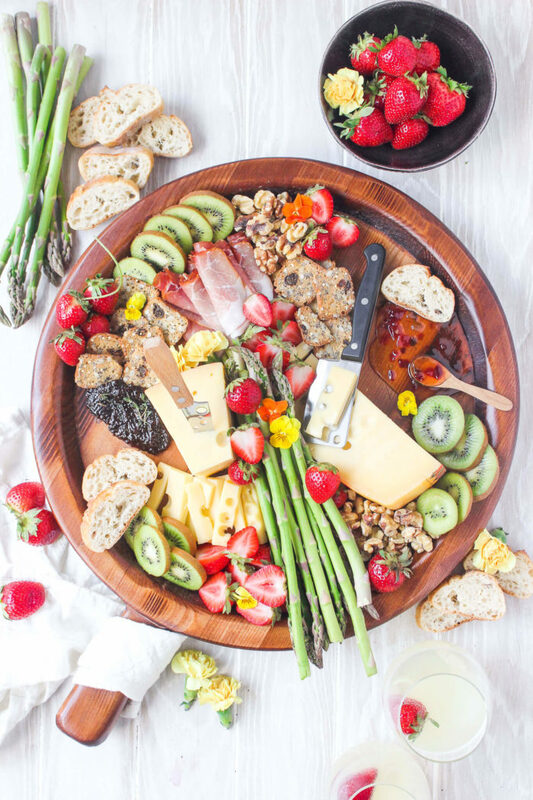 Strawberries and rhubarb are two of my spring favorites, but I also love Jarlsberg© + Kiwis! It’s a little random (and kiwis technically aren’t in season) but I bend the rules for this killer combo. 4.) Throw in some stickiness, be it honey, apricot preserves, onion jam, or blood orange jelly! 5.) To meat, or not to meat? That is the proverbial question. The choice is yours, so do whatever works for your diet and your guests! 5.) Finally, GARNISH. 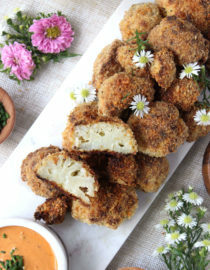 Spicy edible flowers are a beautiful and tasty way to finish this off. Once you’ve chosen your ingredients, find your best wooden board and arrange everything as artfully as possible. I like pre-slicing some of the Jarlsberg for easier consumption, along with the fruit. And once you’re satisfied with your boards elegant, effortless look? Pour some crisp white wine or a cool, refreshing cocktail — I love something cucumber — then sit back, relax, and enjoy! 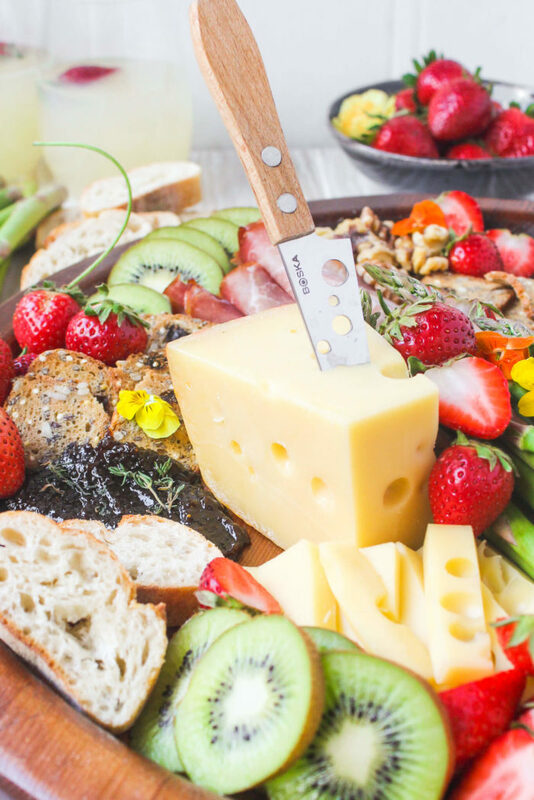 The magic of a Jarlsberg© cheese board deserves to be savored.